If you happen to be a child of the 1970’s (and they’re definitely getting older! ), then you know who John Davidson is. His career spanned television, movies, music and theater, but he’s best known by Gen-Xers as one of the hosts of That’s Incredible!, which was a precursor to the modern reality television show that aired between 1980 and 1984. It had re-enactments of paranormal activities, crazy stunts, and technological breakthroughs that, at the time, were considered…incredible. But Davidson was also an accomplished singer. In fact, he recorded no less than fifteen studio albums between 1964 and 2006, some of which included comedy routines alongside music. His self-titled album is proudly displayed on the walls of our Music Room. 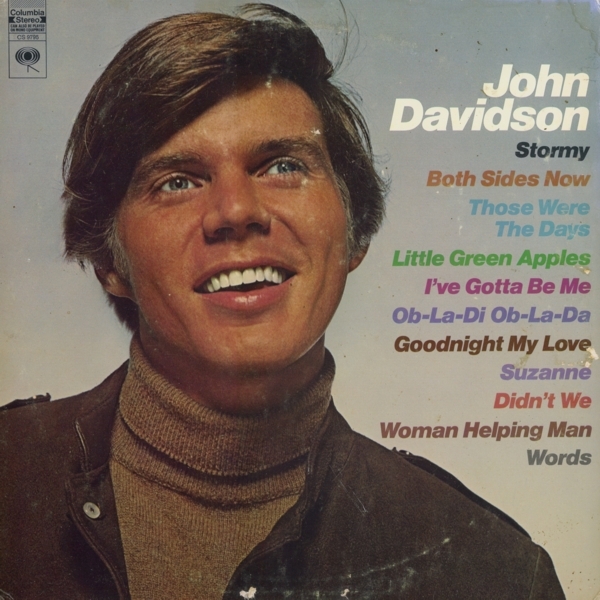 Released in 1969, John Davidson includes songs we’ve all heard before, including The Beatles’ “Ob-La-Di Ob-La-Da,” “I’ve Gotta Be Me,” and “Those Were the Days,” as well as some less-known tunes sharing positive messages about the human condition. Davidson is the son of TWO ministers now active in the Richard Dawkins Foundation for Reason and Science, and active in theater productions across the country.